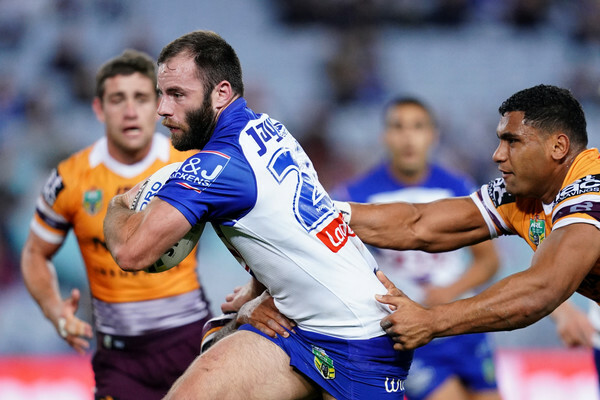 The Bulldogs capitalised on their win over the Wests Tigers in Round 21 with a stunning 36-22 victory over the Broncos on Thursday night at ANZ. Conditions were smoky in Sydney, with controlled burning leaving the players a bit breathless in the opening minutes of the match, but it didn’t stop Canterbury-Bankstown from putting in one of their most decisive attacking openings of the 2018 season, capped off by stellar performances from Will Hopoate, Josh Jackson, Reimis Smith and Lachlan Lewis. A slow peel from James Roberts in the first couple of minutes almost gave Hopoate the chance to crash over, with only a swathe of big Broncos defenders able to prevent him from getting the Steeden to ground, including Roberts himself. With Anthony Milford called offside a couple of tackles later, Rhyse Martin got the first points on the board with a penalty kick. From there, the Broncos tried to respond in kind, but instead showcased some of their most disorganised defence in weeks. It was a bad omen when Jamayne Isaako missed their own first shot at penalty goal, after Josh Morris had obstructed Roberts on his way to contest the high ball with brother Brett, but the real letdown came shortly after, when Brisbane seemed to have made up for missing the first two points with a sharp and efficient try. For a moment, it looked as if Darius Boyd had done a terrific job of grounding a Milford grubber, but the replay showed that he’d knocked the footy on instead of grounding it. The Dogs took heart immediately, with Lewis putting in a pitch perfect kick on the fourth tackle of the next set that gave Brett Morris ample space to contain Isaako in the in goal area and gain Canterbury-Bankstown a goal line dropout. Several tackles into the next set, Lewis kicked once again, and while Corey Oates may have beaten Kerrod Holland in the air, it was all for nothing, as he tapped the ball back with not a Broncos player in sight to clean it up. Michael Lichaa saw his chance, beating Boyd to the football and then spinning the ball across to Jackson for one of the most elegant Bulldogs linkups in weeks. If Boyd had got his try the Broncos would have been aiming to score again on the restart, but the Dogs had scored so quickly that it felt as if they’d robbed Brisbane of their restart, and decisively stamped their home ground advantage on the match. It was now Matt Frawley’s chance to shine, as he booted the ball over to Oates a few minutes later, ricocheting it so that the big winger was unable to gather it once Reimis Smith had stormed up the field and applied a bit of extra pressure. Frawley almost turned into try assister a couple of tackles later, only for Isaako to shut down some good momentum on the left wing. Still, the Dogs got the scrum feed, and while an incorrect play-the-ball from Danny Fualalo got the Broncos some field position, Tevita Pangai Junior lost the footy on the fourth tackle under pressure from Lewis, gifting the hosts the possession they needed to execute one of their best sequences of the entire 2018 season. It started with Jackson realizing that Holland had some space out on the wing, sending across a short ball to his backliner who sped down the sideline and drew in the Broncos defence before booting the footy across to the middle of the field at high speed. In its combination of velocity, strength and precision, it recalled Jordan Rapana’s terrific try assist against the Tigers last year, and Hopoate read the play perfectly, running up the middle to time the bounce perfectly and slam to ground beneath the posts. For a season that has been so mixed, this was a great reminder of to the Canterbury-Bankstown faithful what their team can do when it’s firing on all cylinders – and it felt doubly appropriate that the sequence had been bookended by Hopoate and Jackson, arguably the two best players in blue and white this season. To retain any self-respect the Broncs had to be the next to score, and fortunately for the away crowd a short ball from Andrew McCullough to Korbin Sims right on the line got them the chocolates, with only a half-hearted leg tackle from Aiden Tolman holding him back. A second penalty goal for the Bulldogs allowed them to retain a ten-point lead, but things got a bit tighter when Sims crashed over for a second time two minutes before the break, thanks to a deft chip from Kodi Nikorima that Milford cleaned up and followed with a quick play-the-ball to Isaako. From there, Isaako got it back to Nikorima again, who’d followed his kick and made himself available throughout the entire play, and who now sent it back to Sims to bring it to a four-point game once Isaako added the extras. Brisbane had started a comeback but the Dogs had been too dominant over the first half for the visitors to really feel as if they’d taken control of the game. A third try from Sims might have done it, and for a moment the first stanza seemed as if it might end with just that, as the big frontrower barged his way through Fualalo, Jackson and Eastwood before stretching out an arm to plant the footy right on the try line. In a twist on usual Bunker procedure, the point of scrutiny now wasn’t whether or not Sims had got the football down, but whether or not his elbow had touched the ground before he did so. In regular time, there had been a real dexterity to how Sims had managed to keep his elbow up despite the best efforts of Eastwood struggling beneath him, but in slow motion the Bunker deemed there was sufficient evidence to overrule the onfield ruling of try and thereby deny Sims a hat trick. Sims’ effort was such powerful putdown, and such a powerful statement of purpose, that it would have certainly swung the momentum back in Brisbane’s way if it had been cleared, but as a no try seemed to deflate the Broncos more than ever, paving the way for a sparkling trio of Bulldogs tries to kick off the second stanza. The first was every bit as good as Jackson, Holland and Hopoate’s linkup earlier in the game and started, once again, with Jackson, out on the Dogs’ right edge. This time, Jackson opted for a cut-out pass to Holland, who got it across to Smith just as quickly. Burning up the side of the field, Smith found himself faced with a tackle from Boyd, but the former Brisbane fullback was unable to clean things up, allowing his target to make another twenty metres and then follow it with a quick play-the-ball. On the back of that quick thinking, Frawley, Lewis and Hoppa shifted the Steeden just as rapidly to the other side of the field, where Josh sent it across to Brett to crash over with Roberts clinging desperately around his waist. The Bulldogs didn’t wait any time in scoring again at the end of the next set, where Kahu was powerless under yet another pinpoint kick from Lewis. Seizing his opportunity, Martin shifted the play back to the inside of the field, where Eastwood muscled his way in front of the posts and took the Brisbane tackle rather than trying to do anything fancy. With the Broncos markers staying pretty passive, Frawley scooped up the Steeden and dummied a couple of times before slamming through David Fifita and Josh McGuire to slide across the chalk and score four more. By this stage, the Dogs had utterly decimated the momentum that Brisbane had generated at the end of the first half. They may not have scored again on the restart, but close enough, since it was only a set later that an error from Milford gave Canterbury-Bankstown yet another attacking opportunity. This time, it was an oddload from Holland to Hoppa that set things up, with the blue and white fullback realizing that his best option was to send the footy across to Lewis instead of trying to kick himself. From there, Brett Morris set up Martin in the corner, only for the big second-rower to get the ball back to Josh, who rolled over Nikorima and got it to ground. One of the reasons that Canterbury-Bankstown had been able to develop such a powerful lead had been the strength and accuracy of Martin’s goal kicking, and he added the extras here just as reliably as he had all night. With thirteen minutes on the clock, he also added his second penalty goal on the back of an offside penalty to Matt Lodge, to bring the Bulldogs triple Brisbane’s score at a stunning 36-12.